The Raiders signed Keon Hatcher on Monday off the Green Bay Packers’ practice squad. His arrival helps address an injury-battered position. ALAMEDA, Calif. — Keon Hatcher had plans for his 24th birthday. On Sept. 11, the Raiders wide receiver paid a $6 toll to leave Oakland and cross the Bay Bridge into San Francisco, bound for dinner at an upscale steakhouse in the Pacific Heights neighborhood. But before reaching the city streets, he received a phone call with news. A team official requested his presence at club headquarters to complete the necessary processing. Hatcher altered course, re-crossing the Bay Bridge. The Raiders signed Hatcher on Monday off the Green Bay Packers’ practice squad. His arrival helps address an injury-battered position. The latest chapter came in Sunday’s win over the Arizona Cardinals when Brandon LaFell suffered a third-quarter Achilles’ injury, which led to his Monday placement on season-ending injured reserve. Hatcher spent the 2017 campaign on the Raiders’ practice squad as an undrafted rookie from Arkansas. 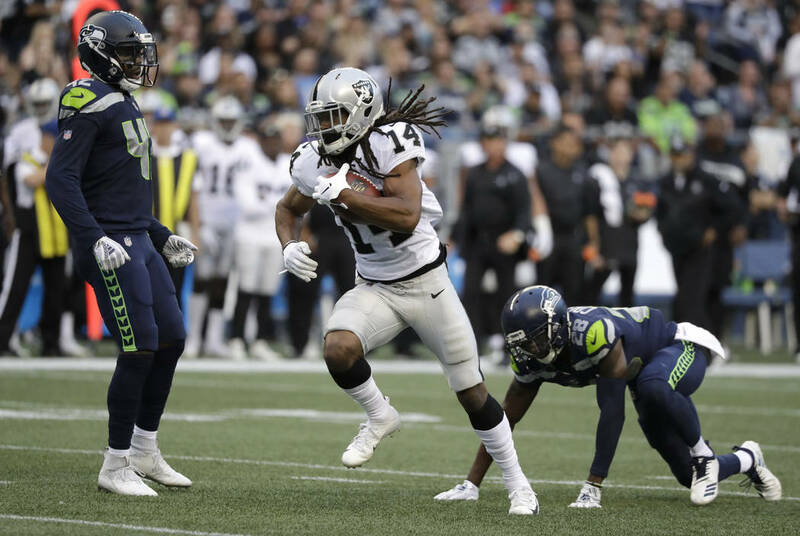 This year, he was on their roster bubble following training camp but dazzled in the Aug. 30 exhibition finale, catching eight of nine passes for 128 yards and three touchdowns versus the Seattle Seahawks. The performance secured his roster spot in favor of wide receiver Martavis Bryant, for one week anyway. Hatcher played 16 snaps — all on special teams — in a Sept. 10 loss to the Los Angeles Rams. A day later, he played 16 candles. Hatcher still stuck to his birthday plans. It’s nearly a 40-minute commute without traffic from the Raiders’ facility to the steakhouse. To make it, he paid another bridge toll, this time $4 because it was after 7 p.m.; the charge is enforced when entering San Francisco, not leaving San Francisco. He arrived and ate alone, dining over dismissal. He ultimately cleared waivers on Sept. 13, briefly joined the Detroit Lions’ practice squad and, beginning on Oct. 9, worked with Green Bay. Shortly after LaFell was injured Sunday, Hatcher’s phone rang again. Today, more opportunity exists on offense than when Hatcher last was here. The club traded Amari Cooper to the Dallas Cowboys last month. Neither Jordy Nelson nor Bryant appeared in Sunday’s 23-21 win over the Arizona Cardinals; both suffered knee injuries a week earlier. Nelson has a contusion. He made the trip to Glendale and is considered closer to a return than Bryant, who is dealing with ligament damage. Nelson did some running Monday morning and has a chance to resume practice this week, coach Jon Gruden said. Marcell Ateman, a rookie seventh-round pick, and Saeed Blacknall, an undrafted rookie, made their NFL debuts Sunday. Ateman started at the “X” receiver spot for Nelson and caught four of five passes for 50 yards. He received a game ball following a 32-yard reception on the game-winning drive and is expected to maintain a substantial role during the final six games. With LaFell sidelined, Hatcher could have a shot.